Who’s the real threat to security: Govt climate policy – or four climbers? 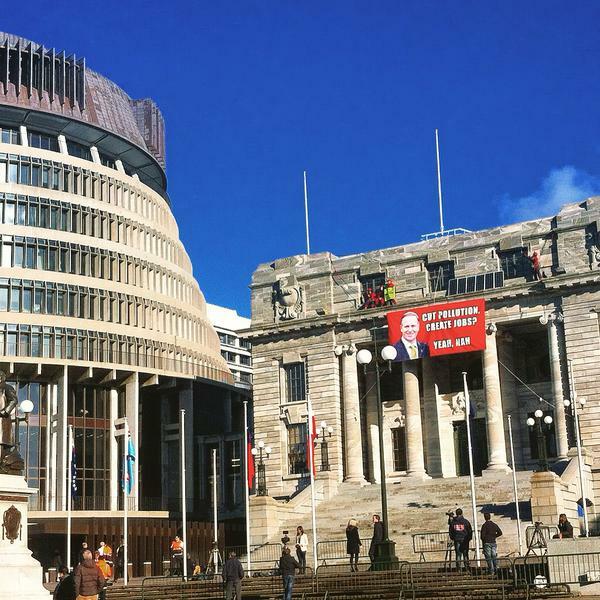 Coal Action Network Aotearoa today congratulated the Greenpeace climbers on the roof of Parliament drawing attention to the lack of Government action on climate change. “Who is the bigger threat to security here: John Key’s apparent intention of letting global temperatures rise by 4degC by taking virtually no action – or four peaceful activists and a few solar panels on a roof?” asked Jeanette Fitzsimons of CANA. The Greenpeace action comes on the back of a Dutch Court yesterday ordering its Government to increase its 2020 emissions reduction target of 17% to at least 25%. New Zealand’s target is 5 percent. “The Dutch Government’s 2020 target was already better than New Zealand’s – yet the court ordered it to increase that target in order to ‘protect its citizens’. The world is moving to tackle climate change, yet New Zealand seems intent on doing as little as possible,” said Cindy Baxter of CANA.